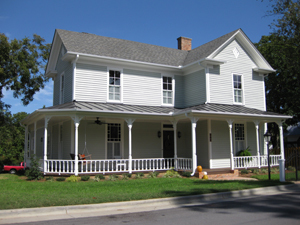 The 2009 AHS home tour includes the Duane Taylor and Sherry Preddy house at 109 Holleman Street, the Doug and Pam Boyette house at 209 East Chatham Street, the Vanessa and Scott Jenkins house at 105 Hunter Street, the Richard and Julia Brooks house at 107 Hunter Street, the 1914 Union Depot at Salem and Center Streets and the Maynard-Pearson House at 1101 Olive Chapel Road. This house, built c.1904, is one of two on the Home Tour this year associated with William Henry Harward and his family, one of Apex’s influential citizens in the early twentieth century. This house was originally built at the corner of Holleman and South Salem Streets, facing Salem Street where the Suntrust Bank now stands. W. H. Harward built the house where he lived with his wife Burlena Freeman Harward when he was President of a local downtown bank and owner of a Salem Street store. The home originally had Queen Anne details, such as intricate sawn work in the gables. Central Carolina Bank purchased the original site to build a bank around 1951 and Dr. Marvin Jones, a local Dentist, and his wife Dixie bought the house and moved it to its present location facing Holleman Street. The Jones family renovated the house in the Colonial Revival style, added a second floor and made several rear and side additions. The Taylor-Preddys purchased the house in 2004. Many of their improvements have come in the form of replacing aging woodwork and equipment. This house, originally built by W. H. Harward, was the second home on East Chatham Street for James Raymond Harward. Before Raymond moved into this house he previously lived in the corner house next door with his first wife, Belle Strickland Harward and their two daughters. He later decided to leave his first wife to marry a much younger woman, Edith Tingen, and moved to the home now owned by the Boyettes and continued to live next door to his first wife. He lived in the new home with his new wife and one of his daughters until he passed away. The second wife later sold the house and it was converted into a multi-family rental property. Mr. Harward operated an auto sales and repair shop in the 1925 building at 104 North Salem Street before it later became the business location for Popes Five and Dime and current resident The Rusty Bucket. He was the son of W. H. Harward, president of a Salem Street bank and owner of downtown stores. 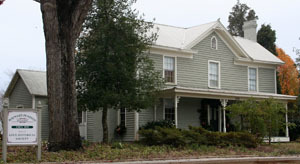 In 2008 the Boyette family purchased the house to restored it as a single family home. Doug and Pam Boyette had been looking for an older home near downtown Apex when the Apex United Methodist Church decided to sell this property in 2008. The Boyettes completely gutted the home and did 99% of the demolition work and most of the restoration work on the fireplace mantels, porch posts, porch spindles, and stain glass windows themselves. New electrical, plumbing, heating and air conditioning services were installed, and the foundation was redone. Most of the heart pine floors are original, except for those in the kitchen which came from an 1850 house in Virginia. All of the six original fireplaces are intact. A screened-in porch and deck were added on the back. Pam states, "It was a lot of hard work, but worth it all. Our hope is that others will see our home as an inspiration to restore other historic properties in Apex". This house was originally built in 1910 for the L.G. Jordan Family. Mr. Jordan was the founder of L.G. Jordan Oil Co, Inc., in Apex, and served as Mayor of Apex and chair of the Wake County Draft Board. The Jordan family occupied the home until 1963. The Jordan heirs sold the home and abutting property in 1980. From 1980 to 2007 the home was owned by three different families. Scott and Vanessa Jenkins purchased the home in 2007 and completely remodeled the home. Renovation of the home has included removal of vinyl siding, repairing the original wrap porch, gutting and remodeling the kitchen, and replacing the roof. The home has 3 fireplaces that were capped after 1963, and all 3 remain unusable but add beauty to each room they adorn. The brickwork of the original fireplace between the family and dining rooms has been exposed. A new addition to the home includes a master suite, laundry room, pantry and garage. New hickory flooring has been used throughout the home. In landscaping the lawn, a paver walk area was added at the front steps. This walk incorporates old stones found buried on site. 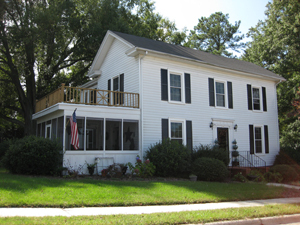 The Jenkins believe this renovated home will greatly contribute to the beauty and unique character of the Town of Apex Historic District. By showing their home, they hope to encourage people to renovate historic homes and preserve the exterior while at the same time letting the interior reflect their needs and personal style. 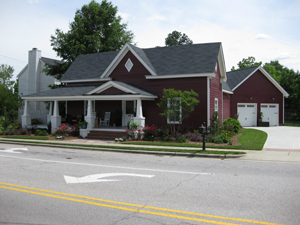 This home was awarded the Town of Apex Appearance Award in 2008. This house was built in 1910 by H. T. and Sallie McNeil as their dwelling. V. W. Tunstall purchased the house in 1937, and subsequently sold the house to George and Louise Brooks in 1944. Renovations in 1944 included the addition of the master bedroom and back porch. Following the death of George Brooks the house became rental property from 1962 to 1982. Richard Brooks purchased the house from his grandmother, Louise Brooks Womble, in 1982. In 1990, Richard added the master bathroom and renovated the kitchen. After Richard’s marriage to Julia in 2005, the Brooks modified the back porch into a den and updated the 3rd bedroom into an office/utility room. 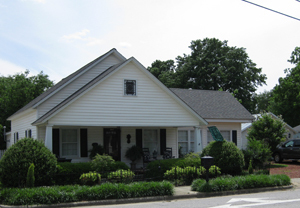 In April 2007, the house won the Apex Appearance Award from the Town of Apex, and in December 2007, the house was featured in an article, Ties to the Past by Kelly Reep. The 1870’s farmhouse has changed little since its last remodeling in 1944. A picture in the 1900's shows the original porch across the front and rooms to the rear. The home was built in 1870 by James Jackson Maynard and Civil D. Pearson Maynard and in 1883 was bought by John Phineous Pearson and Ida Colon Maynard Pearson. The home remained in the Maynard-Pearson family until 1994 when a portion of the farm was sold to M.J.K. Development, which later deeded the house to the Maynard-Pearson House Trust under the Apex Historical Society umbrella. The last Pearson to live in the home was Dr. Paul Lamar pearson. He also owned a house a few hundred feet east of the MP House and used it for his Dental office. Generous support and countless hours of hard work have made the house into what it is today: a museum of rural living which offers educational tours for adults and children alike. Not only is the Maynard-Pearson House an example of restoration and preservation, it is a source of inspiration for period furnishings. Careful tour visitors will recognize names at the Maynard-Pearson House as those they’ve seen at the Apex Cemetery. Read more about the Maynard-Pearson House and family history. The 1914 Union Depot is listed in the National Register of Historic Places and has been preserved as it looked when it served as the town's train depot for rail travelers. The depot was the site of the Apex library in recent years until the library moved to a permanent location and the building became home for the Apex Chamber of Commerce. The building is open throughout the year for those needing to contact the Chamber of Commerce or just wanting to see the old depot site.